UPDATE: Added SOTC and moved We happy few in the honourable mentions. When I have played LIS season 1 the first time, I gave up after first episode in 2017. It felt it a bit sluggish and while the time rewind mechanic was cool, this whole teenage drama did not interest me much. However, I gave the game a second chance and replayed it again almost a year after my first try. This time, something felt different. I have finished the game within 5 days (too bad I did not end up on Friday) but basically could not stop. I devoured 1 episode per day and finally understood what the whole deal is with this series. Although it starts rather slow, everything changes at the end of episode 2 and onwards. I love games about time travel and LIS gave me exactly what I wanted – likeable characters, realistic relationships and engaging story. Getting to know Chloe and Max felt well done just right and many people shed a few tears when they reached the end. Later, I have also played Before the Storm, which I was avoiding until then. Again, the game proved me I was wrong. While some things got retconned and did not make sense (not sure if by accident or by intention), overall, it was still great finally to be able to meet Rachel and see what all the fuss was about. The bonus episode, Farewell, gives us also the final, teary look at Chloe and Max, before Max leaves for Seattle. Then we got free episode of Captain Spirit and first episode of Life is Strange 2. If you love LOK series and story driven games, give this series a try. LIS series blows Telltale games out of the water and shows them how it is done. This is probably the best investment Square Enix got right in the last years. After a not so great Syndicate (I was a lot more entertained by Unity), here comes the grand game by Ubisoft. I am just about to finish it but still have almost a third of the map undiscovered – the scope of this game is so vast. I found myself doing most of the side quests, not because I was forced to due to level restrictions, but because I wanted. Bayek and Aya work great together (much better than Jacob and Evie ever did) and following their story of neverending vengeance is quite a spectacle. Not to mention the superb exotic and detailed Egyptian environments – this game has more tombs and does them better than any of the latest TR games! I thoroughly enjoyed playing this and the movement, characters and gameplay just feel so right. I am looking forward to playing Odyssey and Witcher 3 after this. Highly recommended. How could I have forgotten to add this gem? I have spent countless hours on the original ps2 game and to finally being able to see this in proper framerate and upgraded graphics is breathtaking. The developers used the original engine but swapped out all the graphical assets out (except the beautifl haunting music, luckily) and the game feels and plays great. Only complaint is that the preset control scheme has only been improved slightly (jump is finally X not triangle), however, it is still uncomfortable to control Argo (which is solved by remapping the buttons in PS4 menu). Overall, it is an excellent masterpiece where the lonely and abandoned land is the only obstacle between you and giant colossi. Definitely a must play and one of my top games ever, now in modern graphics. After getting myself sucked into the depths of first Dark Souls game, I have skipped 2 and dove straight into 3. From Software improved gameplay (8-way rolling, yey), graphics and netcode, everything just feels great in this game. Boss battles are epic and this is a true sequel to DS1. Too bad the two DLCs/Season's pass are still quite expensive but are still worth it. The Ringed City serves as a proper ending, although not possibly what everybody expected, it is a must to play. This game is amazing and discovering more about its lore was so rewarding I got a few books right after finishing it. Later in the year I have also tried DS2 but was apalled by the terrible controls which are refined and tight in DS1/3 but in 2, the rotation of the character around its axis is sluggish and feels like gliding, not even mods fixed it for me. DS1 and DS3 are well worth the sweat and tears. This is one of the gems, which I have shamefully omitted since its initial release in 2014. I have fell in love with this and the mechanics as soon as I have started playing it. If you play on survival difficulty, it is quite a test in the first few chapters but well rewarding. The dark atmosphere and gameplay is reminiscent of Resident Evil 4 and the horror elements are like from Silent hill – a perfect match. The enemies do not die permanently unless you get rid of their heads or burn them with matches, but main character Sebastian has only a limited supply, so it is always nerve wracking if the zombie will get up or not. While the ending leaves usually everybody completely baffled, this is remedied somewhat by the DLC where you play as Kidman and the game shows you her side of the story. It is done brilliantly because Kidman does not have weapons, just a torch, so you need to sneak around strategically and the addition of a stalking monster just contributes to the tension. I have found the second game to be not as good as the first one, unfortunately, though. Vicarious Visions remade our beloved furry bandicoot and finally made him available at all platforms after a year of timed PS4 exclusivity. While the versions for PS4 and Xbox1 are both capped at 30fps, pc offers a smooth 60fps with several graphical options, so this is best version to play. I almost gave upon the game on PS4 when it released due to the alterations of jumping collision/distance as the devs had to build this game from scratch, but luckily the controls have been improved since. The music was remade as well and while I think it did it justice, I wish they would have remastered the original soundtrack too and included it as an option. Overall, great remake and looking forward to playing Crash Team Racing! Everybody remembers the amazing but super slow (especially PAL version) first DMC on PS2. Then the horrible DMC2 came out (which I have not played still) and then the same studio redeemed itself with one of the best action games ever with DMC3. DMC and DMC2 were never ported to pc before, so this is their debut and DMC3 finally got the port it deserves (no more problems with swapped out joy sticks!). As a DMC fan, I can fully recommend this collection and while things could have been improved further (menus are still only 4:3 and cutscenes could be higher resolution), it is a must own for any action fan. SH3 is my favourite SH game and I have found a widescreen mod to replay it again. This game barely aged! It certainly profits from all in-game cutscenes as you can put the resolution right up and it looks great, even after all these years. The character models are highly detailed and mo-cap is convincing too. Heather is not your typical hero, but a normal girl, at least at first glance. She shows all sorts of emotions throughout the journey and it was great to watch her grow. This is the true sequel to SH1 and it is a damn good one according to others as well! Now this playthrough was completely unplanned but I somehow found myself being called back to the silent town just a few weeks ago, right after finishing SH3. I have stumbled upon an even greater mod selection called the Enhanced edition – a selection of best mods available out there all in one page and you can actually select which mods you want to include in your game folder. It enhances the game greatly, something which the atrocious original port failed so miserably when it was released on pc. If you are ever considering to play SH2 again, definitely upgrade your version to include these mods for the ultimate horror experience. First Fear game and its dlc have a special place in my library – I have already played them over about 3 to 4 times and I might give it a go again at some point. The A.I. in this game is brilliant and I have yet to find a game in which the enemies behave so tactically. The horror atmosphere is also great and this game belongs to my top fps games of all time. While I have played the official sequels, they have lost the appeal of what made the original game so good, which is a shame. 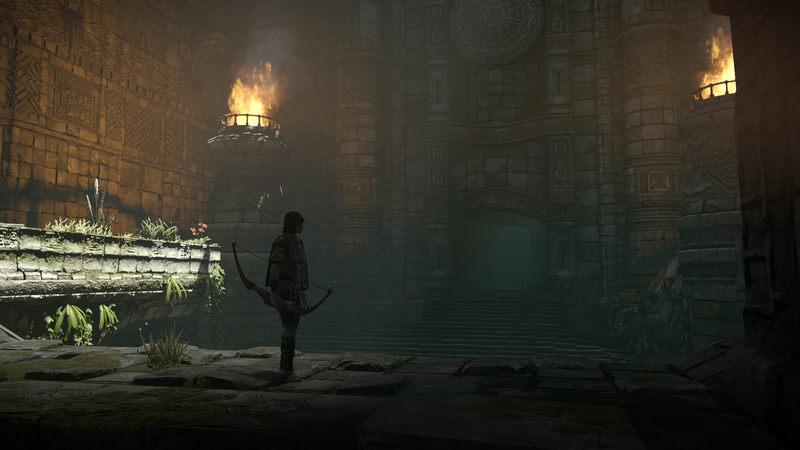 It pains me to be writing this but I have just not enjoyed the newest instance of Tomb Raider. Eidos Montreal tried to make things a bit different but in the end, their efforts fell flat and while the other games in the series usually lost their pace about halfway through, Shadow just gives up after a couple of hours. The bland gameplay and corridor like levels just were not fun to play through for me even when stealth kills and mud camo was a welcomed addition. Character development is lacking and I found myself just not caring about anybody in this game. The game introduced hub levels as well, where you can't draw your guns or in one instance, change outfits (which is annoying as you spend a lot of time there) and they just slowed down the pace a bit too much to my taste. I have enjoyed both 2013 and Rise but I simply can't recommend Shadow of TR unless on a big sale. I hope the next game will be by Crystal and the deleted ending suggest we might be going back to the roots of the series. Wolf Among Us is one of those games I had in my library for a while and I could not be bothered to play. I am super glad I did, as this is the best Telltale has produced to this date. The game is based on Fables comic book series and portrays what has happened in the various fairy tales after their stories have ended. They have been forced to live in our real life world and watching them struggle with every day problems is strange at first and we get to see them from a very different point of view Together with Tales of Borderlands, this is the best that Telltale have produced before its fall and it hurts that we will never see the continuation of this game in the future. This one is a weird one as I got this for a review and got myself quite sucked in! It did take me a while to get into Arthur's shoes but I got there in the end. The story is quite intriguing and to watch the downfall of once prosperous country is quite a chilling tale. WHF takes place on an alternate timeline, in which the Germans have won in the second world war. Shortly after, they began deporting children from UK until there were none left. I still have not finished the game (only the first section for Arthur) and I am keen to get to the bottom of this mystery. This game is plagued by the early access syndrome, however, and it is certainly not worth the high price tag it got when it released. Tread carefully with this one and maybe get it on a sale. Well, that was it. I am really wondering what awaits us in 2019 game wise. In the meantime, have a look at Bazielim´s top 10 as well at his Cult of Hash'ak'gik blog. Since the very first release of Legions of Nosgoth, I have printed the cards and played this game several times. Things which sound good on paper sometimes do not translate into real life, so I have adjusted several cards, cleaned up some artwork and edited a few rules. I have also removed the digital online version of it, so now it only can be printed in order to play. It is a minor incovenience, however, I feel this game works best this way. Even if you do not plan on printing it, it might be worth at least checking the cards out if you are interested to have a look. The download below includes pdf rulebook, high quality PNGs to print all the decks and the energy cards. Hope you´ll have fun, just bear in mind that one game can take up to 2 hours to finish so best find enough time to play this with a fellow LOK fan! 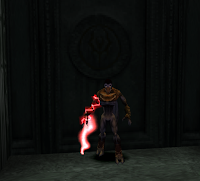 It is really hard to believe that now, 15 years later since the last entry in the series, there are still plentiful secrets in our beloved world Nosgoth to find. In collaboration with Ben Lincoln, Gh0stBlade, Eoghan, Aevum, AesirHod, Bazielim, Kevin and Mama Robotnik, we can now show you the exciting new footage, screenshots and comparisons from these newly discovered SR1 beta versions and BO alpha versions. 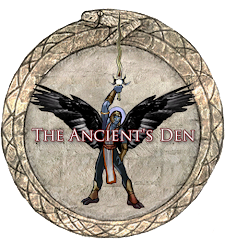 This is the biggest discovery we had in a while so below are links to videos and pages where you can read about our findings: The Lost Worlds and Legacy of Kain Wikia posts. For more about the Chronoplast visions and screenshots read here. Below are videos from the actual Chronoplast rooms and Blood Omen Chess Match. More content to follow as this post will be updated! Last image is from ModelEx by AesirHod. 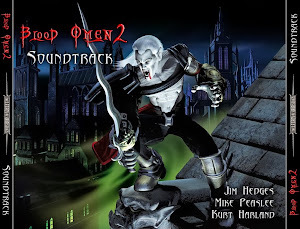 New Blood Omen pc patch! Do you finally want to play BO in window mode, smooth 60fps and high resolution cutscenes? Well, now you can thanks to Verok! Head over to his blog where you can download the installation package. If you already have the game installed, just paste and overwrite the contents into your game folder. Before you click on Kain.exe and if you are on Win7 just set the compatibility to Win98/ME and you can adjust some additional settings. After that go to task manager and set affinity to all cores to receive speed up in fps. I have done this over an already existing installation via Cuban Raul´s installer and everything works perfectly! 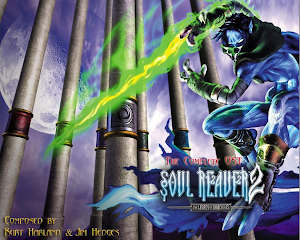 It has been two years since the seventh version of the Soul Reaver soundtrack was released and I have considered whether a re-recording might be necessary after some time. In a recent replay of Soul Reaver, I have changed the plugins around a bit and decided it might be worth a shot re-record every track with something which sounds closer to what it would be on PlayStation and on higher bitrate. While OST v7 was recorded with cubic interpolation which has better treble, version 8 was recorded with gaussian interpolation setting. This makes the sound a lot deeper and richer, while losing some of its clarity. I have also renamed a few tracks, added a few which were previously included but missing in 7. version. The attached read me file goes into a deeper detail on what is new. I hope you´ll enjoy this latest update. I will remove v7 in a week or two, so if you want to compare them or prefer a stronger treble, download the old version here. 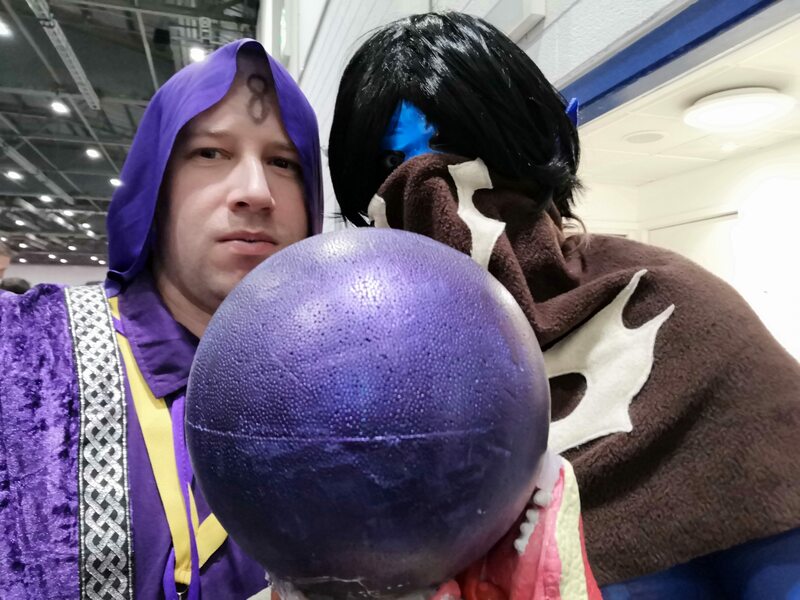 MCM this year is over yet again and we had loads of fun. Friday was probably the best con day I have ever experienced. Everything was great - no big queues, plenty of space to walk around, enough cosplayers to look at and we could sit and watch any panel without issues. I was planning to cosplay Rachel Amber in the morning, but since we got into our hotel at 11am, I have decided to change into Chloe Price straight away as we had about 15min walking + getting our wristbands at the Excel as well. However, it was liberating to be able to breath freely, take pics with my phone as usually I am struggling to do anything with my hands or move. It felt good to be human again. Baziel was accompanying me as Cpt. Spirit and we eventually found a fellow Spirit cosplayer, which was awesome! 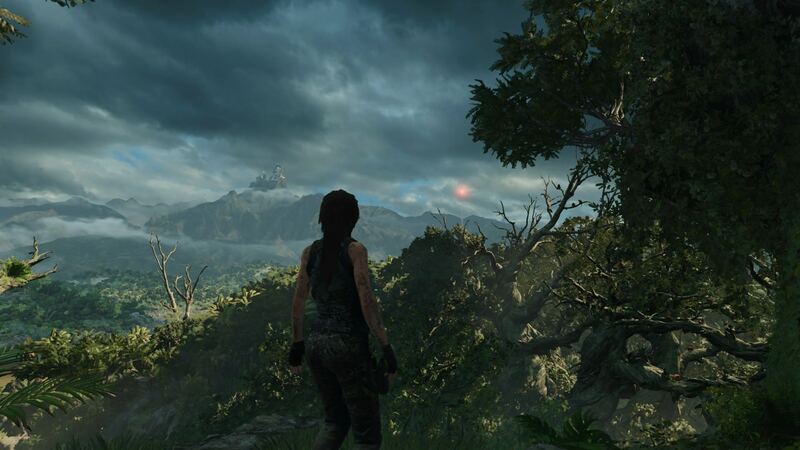 Lara Croft has traversed many kilometres in her existence. First, she presented herself to us in her blocky form in 1996, but as the polygons got more rounded in the later games, it ultimately led to her demise, in the form of barely playable catastrophe named Angel of Darkness. Originally, AOD was meant to become this grand trilogy, but Eidos had to scrap the rest due to bad sales and low quality of the game. Lara has pretty much disappeared from our sight after this terrible ordeal. Meanwhile, Eidos was thinking on how resurrect our popular heroine and ordered Core Design and Crystal Dynamics with something exciting. Both studios produced a prototype of an anniversary version of the very first TR, but Core has not learnt its lesson. According to the leaked footage, they were clinging onto the old 3D control scheme, where Lara is basically stuck to the ground and has to slowly turn to switch directions (famously known as the tank controls), while Crystal has shown much modern approach to gameplay. They have moved the emphasis from hanging onto the ledges into automatic grabs and climbing. What has happened after, is history. Legend, Anniversary and Underworld were a successful reboot trilogy, however, failed to reach the success of the original TR. 2013 has brought us yet another reboot of the brand, again in the reigns of CD. This time, they have shown us a much more vulnerable side to Lara, stranded on a mysterious japanese island, her very first adventure with a new group called Trinity in her way. While this part contained a lot of shoot-outs and almost no tombs, the game was widely well received equally by most players and reviewers. After this success, we were given Rise of TR, which gave us a breath taking introduction in the mountains and beatiful Syria and Siberia. Some aspects got better, some worse, but as Crystal was working on the new Avengers game, the next TR game was given to the hands of Eidos Montreal. This for me was the first warning sign, that maybe I should wait for reviews first. 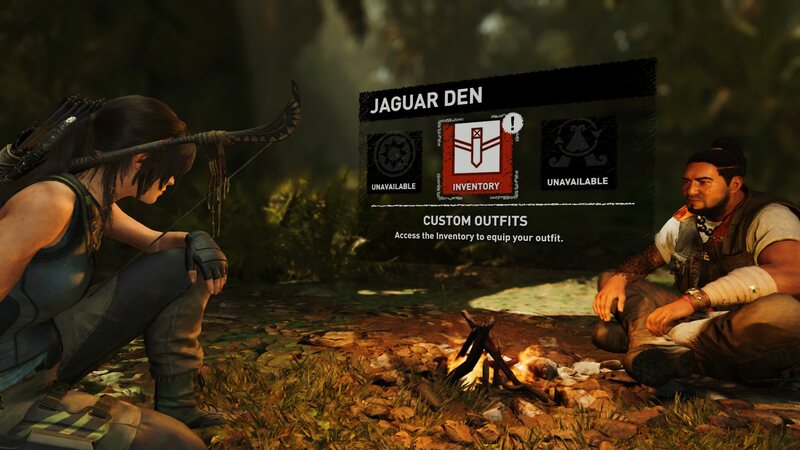 So what could have possibly gone wrong with Shadow of Tomb Raider? We have more tombs, less action and still, the game does not function well on its own. It is difficult to pin-point which aspect Montreal has failed on, but everything which made the previous two games fun such as exploration and discovery of new weapons and tools is just midlessly thrown into the game. I had no sense of Lara herself being motivated or growing throughout the adventure. Yes, you still discover the old forgotten cities and temples, but it does not have the same drive as in the previous titles. You´ll definitely won't be making the infamous sigh which Lara cheesily produced before which is a bit of a surprise as I have seen many reviews giving this game a 9/10. Another thing which made me scratch my head was the arsenal of weapons Lara can get. It feels redundant as there is no reason to buy or upgrade any other weapons besides the ones you find. SOTR suffers overall due to poorly thought out level design and while technically it is well made, it is missing the playfulness of the previous games. The first big change that you'll notice is the unlocking of the abilities. The skill tree is now shown across the whole screen and you don't need to switch between three categories anymore. On one side, it is a good change but now the icons of the main categories are covering up half the screen for no reason and the actual skills are laid out in a grid like system. In the end, I've found it more confusing than useful. The worst thing about the skill tree is its efficiency. Besides some of the basic first skills you unlock automatically during the story, most of the skills are unneccesary like certain prolonged effects of berries or survival instict upgrades. The only one which was worth investing into was holding your breath for longer period of time (which you get for free anyway in one of the challenge tombs), the rest you can completely forget about as they barely do anything interesting. One of the new additions in the game is the ability to dress into costumes with separate top and bottom parts as you can now combine different outfits together. Some of them possess certain attributes such as the hide from jaguar which makes you less visible to enemies and the boots from animal skin are less noisy. It is a nice addition but again, it didn't really matter in the end. In one of the hub cities you will be actually forced to wear a tribal costume, which wouldn't be such an issue if you were not in it for almost half of the game. This undermines this whole new system of combining these outfits, so most of them you won't be able to wear. Swimming in the previous games was mostly focused on the surface but Shadow has finally added submerging fully and it is quite well presented. Lara will get to chance to swim a lot and you will find underwater passages quite often. You can speed up your swimming underwater as many times you might be pressed for time to find an air bubble to replenish your air supply. There are also eels patrolling some routes so you need to be careful and hide in the weed to avoid them. It is a bit of a shame that breathing the trapped air animation is exactly the same every time. I didn't like such prominent focus on combat in TR 2013 and Rise, especially the passages where you could not avoid and the game made you into Rambo. In Shadow, you can count these on your hand. On one side, I find it nice that the authors listened to the complaints but now we fell into the exactly opposite extreme. The spaces where Lara is facing Trinity soldiers are a lot tighter and in some moments you have to use your knife and stealth approach only. Interesting addition is applying mud to your face and clothing, so Lara can blend in with the environment a lot easier without being seen. Stealth kills are a fun to perform but Shadow suffers from the corner syndrom (so typical for AC series), so all you have to do is to be stand against the wall and press a button to kill all the unsuspecting enemies. I am glad that they have added more ways to kill the enemies but it could have been better and more freely incorporated with the rest of the game. Some enemies (most of them towards the end) are wearing helmets, making headshots practically impossible without alerting everybody around, which is not fun if you enjoy using the bow. Another new gadget is the thermal goggles, which some enemies start using later on and only if you cover yourself in mud you won't be seen when hiding in vegetation. However, there is an issue when trying to aim for when enemies are up close. The target reticular is a bit big and it can be difficult to shoot things in front of you. I have also noticed a strange way Lara equips the shotgun which miraculously just jumps straight into her hands which looks quite jarring. Overall pacing of the game is uneven and after a pretty hectic beginning, all goes to a halt. Which, as such, is not a bad thing but when the game offers you two pretty big hubs to explore and there is no combat, everything slows down too much and you find yourself doing the boring sidquests in the hope of receiving something of value. Nope, sometimes you get a piece of outfit, sometimes just a mark on your map where a rare animal is or a challenge tomb is hidden. Things you can find easily yourself as the maps are very restricted and linear. TR 2013 had its charm in its uncharted island and Rise in its superb snow effects and they both have what Shadow is lacking – variability. Yes, both of these ran out of steam about halfway through, had too much action, explosions and had predictable story but at least the gameplay as such was still fun and environments were interesting to look at. With a game titled TR I would also expect minimum bugs. I was especially looking forward to the fight with the jaguars. 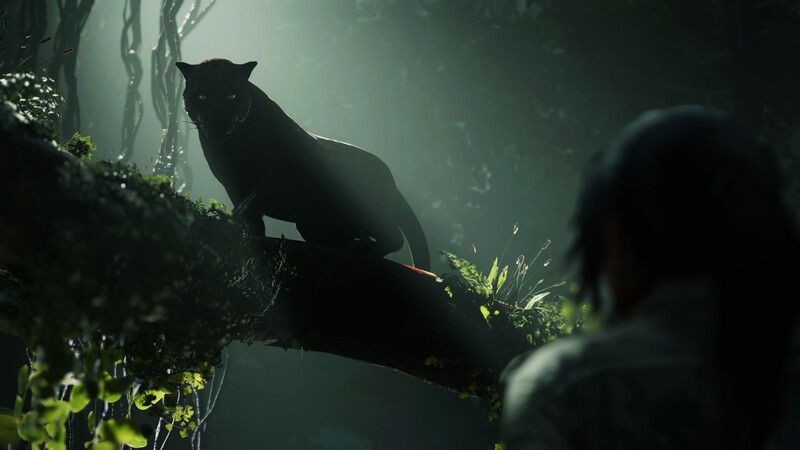 The music got more intense as I was drawing near the jaguar's nest but as soon as I got there, something was off. I found my foe crouching in the grass in the middle of the arena, just standing still, occasionally letting out a roar. Confused, I started to fire arrows into its back but the beast did not care at all. Only after I walked really close, it suddenly shot out of its position directly into a… wall. Luckily, the animal came to its senses and started attacking but the whole excitement of this fight evaporated. I haven't seen this bug since but it was a big letdown to see this within the first two hours of the game. Another issue happenes when you play the game under DX11. For some reason, as soon as you enter the first cave in the game, there is a horrible stutter, making it impossible to play. Only setting the game on a higher priority in the task manager remedied this but previous titles did not suffer from this problem. Graphically, Shadow is on a similar level as Rise, there are not many major improvements. At the beginning I was enjoying walking in a deep mud and quite dense dark jungle enveloped in a light mist. All of the atmosphere was gone as soon as the sun came up and the whole feeling of being stranded kinda dissipates. Some views in the game are still nice but in comparison to its older siblings, I had barely pressed F12 besides getting a few screenshots for this review. Maybe it is due to jungle for not being as interesting during daylight as darker environments. Unfortunately, the music is again forgettable. I guess the days of iconic melodies from the nineties are long gone now and replaced with a bunch of repetetive tribal motives. Less is sometimes more and I would have enjoyed the silence of Lara's footsteps and occasional mysterious cries or squeals coming from the depths of the tombs instead. The constant drumming can get irritating when you are trying to focus on climbing or just absorbing the atmosphere around you. The story of TR was never its strong point. Even going back to the oldest TR games or the previous trilogy, the story was always the weakest part. It is a bit confusing why is it such a hard thing to craft a more compelling story than the premise of finding an artifact and get home. Even employing Rhianna Prattchett for TR 2013 did not help much but it at least they gave us a backstory on the various Endurance crew survivors through logs and camera footage. Rise had a bit less of it but Shadow completely gives up pretending to make you care. 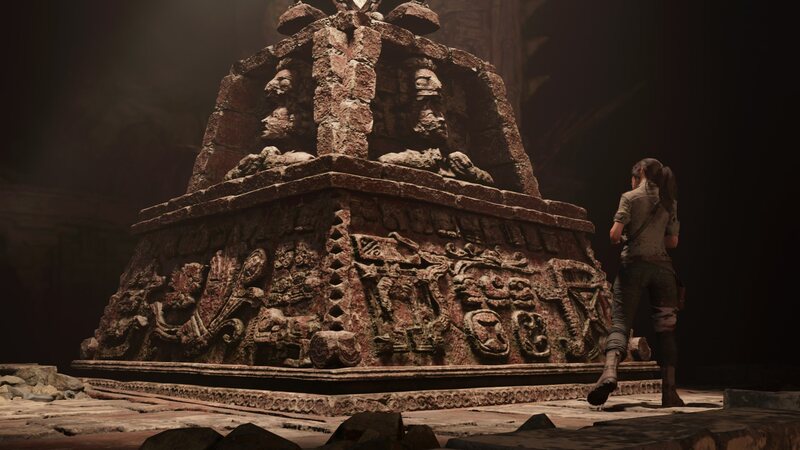 In the beginning, Lara is trying to cope with her deed which caused a major cataclysm, costing hundreds of lives by stealing a sacred mayan dagger from its final resting place. This apparently puts a whole prophecy in motion which will ultimatley lead into the destruction of the world if Lara does not prevent it. She regrets the whole ordeal for like few minutes, shouts a bit at her companion Jonah and then goes back to the peaceful exploration of the cities and fetching side quests. Any sense of urgency is just not present well here. Trinity are forgettable as ever together with their leader whose motivations do not make much sense. The only moment which stuck in my mind was when Lara finally gets angry with everything and there is a cool scene of her rising up (those who played know exactly which one), but there simply isn't such an iconic moment till the end of the game after this. The finale was a letdown as well. You just run to the end of the level while things explode and helicopters can't hit you if you keep moving (because plot armour) and the final confrontation is just completely emotionless. Even when the devs had a chance to make a meaningful impact, everything is suddenly all okay. 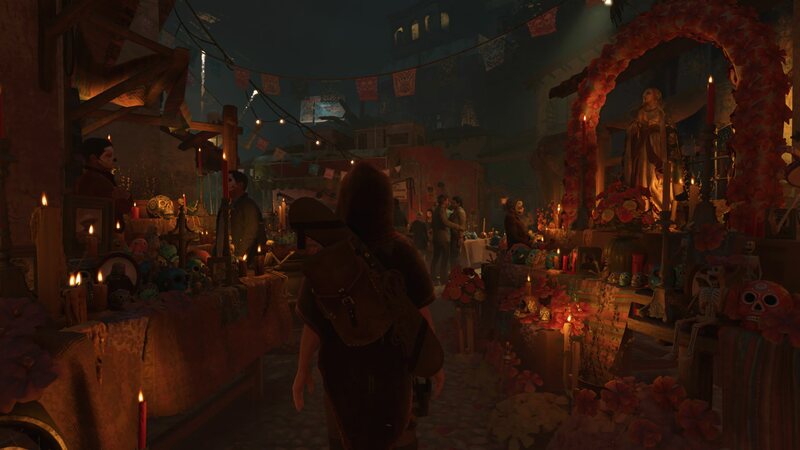 There is just no progress, no lesson learned and Lara just moves on as if nothing happened, just another day with an a new artefact in her possession. The post credit scene does not give us any resolution or a hint of what is Lara up to next. That is not until you witness the alternate ending which got released with the game by accident and that gives us a lot more closure just by adding two little nods to the old games. The game is also a lot shorter, almost twice as short as Rise of TR, which came as a bit of a surprise. I was expecting a longer experience, but on one hand I was happy that I didn't have to play more of this game due to lack of fun factor. It was supposed to be the pinnacle of the new reboot series but instead, it fell short. I can feel that the authors tried to play it safe while not changing too much and just adding bits and pieces here and there but in the end, it just felt hastily tacked on and without much cohesion. Possible explanation could be the DLC packages and first one called the Forge will add a new area and a co-op mode. However, not even NG+ mode will save it for me and while I felt that I wanted to replay TR 2013 and Rise again, Shadow left me with a bland aftertaste. Alas, I've just found the game boring as a long term fan of TR series. There were simply a lot more things I didn't like about it. I can just hope that the authors will improve upon their mistakes, that is if Square Enix will even give them the next game after questionable quality of this . 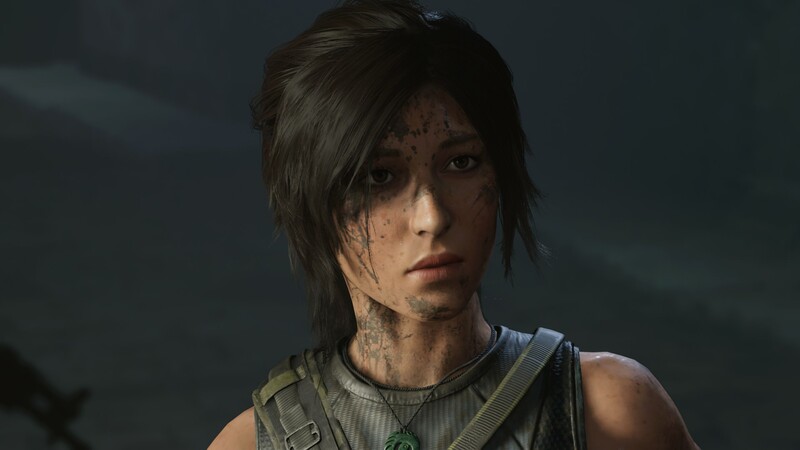 As it stands now, it is a pale shadow of the Tomb Raider legacy. 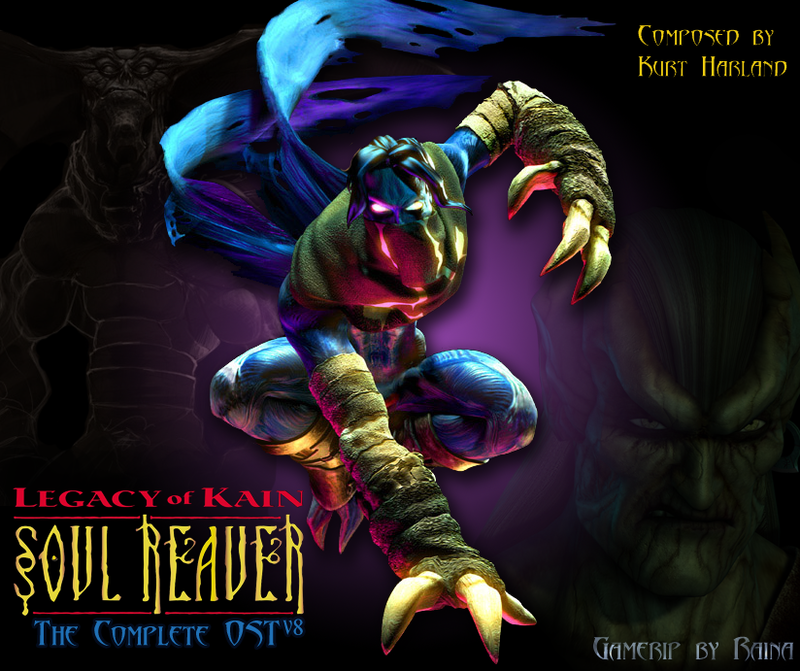 Soul Reaver 2 walkthrough online! 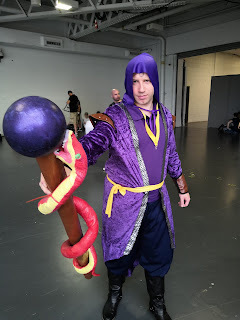 I attended LFCC first time this year as after attending several MCMs at London Excel I felt a need for change. 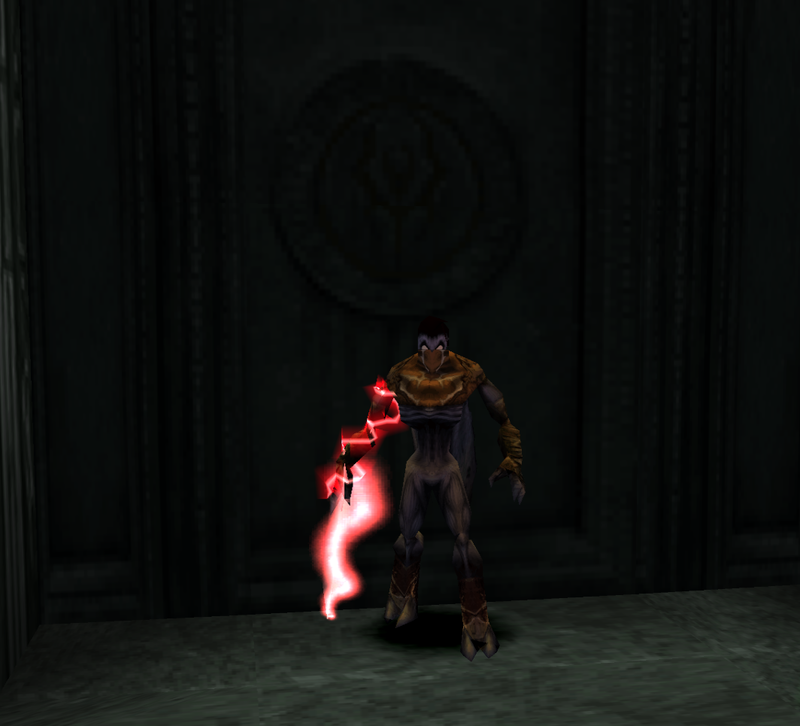 This time I wanted to do another Legacy of Kain cosplay and felt like it is time for me to portray an ancient vampire. I got inspiration for my fellow friend Lucinvampire and her Janos costume. My attempt was not at any ancient in particular, but you can spot the resemblence to Janos´s outfit. It took me quite a while to figure out the details, especially the wings. I ended up cannibalizing some parts of my previous costumes (practice which is not unknown to most cosplayers). Luckily, none of those pieces were damaged and I can freely use them between costumes (like boots or ears). My golden boots got another spray paint layer and also I have made new thicker leather guards for them so they would not bend as easily. This time, I glued my ears with spirit gum, so did not have to worry about losing them. 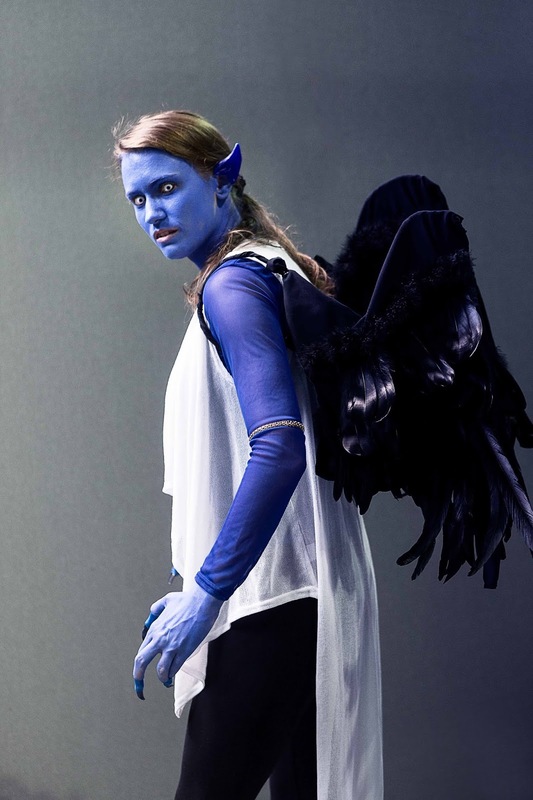 Since last year I have done Raziel´s bat wings, I felt like trying feather wings for a change. Getting feathers was the easy part, how to attach them securely to the construction was another. I wanted them to be posable as well, so I have used alluminum wire with cloth for the main body, like I have done for the bat wings. I have attached all the feathers in small horizontal rows using velcro strips (hook and loop) and in the end, I ended up stapling them all on. The glue from the velcro was not strong enough to hold securely (at one point, all of it peeled off), so the stapler worked really well. For the main body I have used black leggings (I had wet look tight trousers ready but it was just too hot that day), white robe and blue see through blouse. 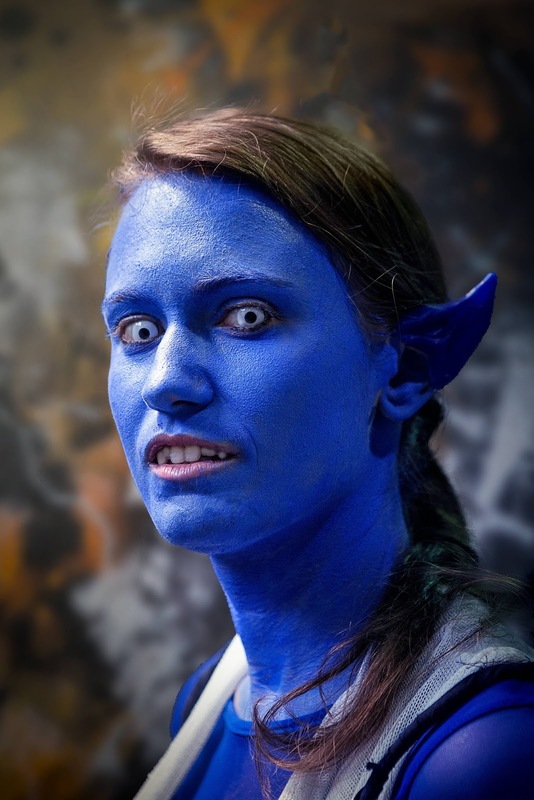 For my face I wore my white eye contact lenses (those are actual prescription ones) and painted my face blue. For my hands I used painted witch fingers to create a tri-claw effect. Painting my hands was the worst decision, unfortunately, as I could not touch anything at all, which was super frustrating and I wish I would have gone for gloves instead (that is already on the list of improvements). The wings, which were the part I worried about most, were the sturdiest piece of my costume in the end. None of the feather layers fell off and even when I was walking, they were joyfully bobbing up and down with me. Baziel finally did his long awaited Moebius costume. He did the snake staff with the ball all on his own (I painted the snake red and yellow). I was really worried it would not hold but with a bit of glue gun and screws it all held together really nicely! Moebius´s costume is actually quite complex, but I feel we improvised well and I got to use my lame sewing skills to create a v-shape in the back of the tail and attached shoulder pads (originally from an executioner costume). As to the convention itself, it was cheaper than MCM by a bit and I wanted to see what a Friday felt like there for comparison. After we got off the train we went the wrong way at first for few minutes, there were no signs for regular visitors so we ended up going all the way around the venue just to get in. We waited in the queue for about 10 mins and then got in without issues. Maybe it was due to Friday being quieter than the rest of the weekend but I was a bit underwhelmed by the stuff inside. There were plenty of opportunities to shop for merchandise but it felt a bit lackluster, especially when compared to MCM. These were just two interconnected halls with not much going on that day. There was practically no seating throughout the whole venue (if you do not count the panels) and while there was a blue mat in the middle to sit down on, for people in costumes it was impractical to sit down completely. I think better solution was to provide any soft stuff to sit on or even bean bag chairs, as MCM has done in the past. I was not interested in the panels, so after about 2,5 hours of constant walking, we got exhausted (it was 30 degrees outside that day) really quickly. The airconditioning did not work too well in the main halls. Within the first ten minutes we got first photo opp and while we spent only like two or three hours there total, we got several people stopping us and taking pictures which always makes me super happy. I even got a professional photographer take pictures of me. The result was pretty stunning compared to the pictures taking by me on my phone. He is pleasure to pose for and definitely give him a follow @Colin Eastaugh. Overall, it was a good experience, even though we left earlier than I´ve thought. Met my awesome friends again which made everything worth it. Next time, however, I will be at MCM London this October, sporting some new cosplays on Friday and Saturday. Be sure to stop by and say hello! I will reveal what I am cosplaying later on. here are two interesting videos for you to look at. First one is an interview my SoulRev coleague, Francesco, talking about game development and also shining some light about our project. We are still kicking even though things not always go as fast as we would wish. Second one is the well known Hylden aka Patrick Johnson who just joined Patreon and it showcases first video footage of Soul Revenant as well. You can now support his artwork or even request to make models for you. After years of working for EA, this news is perhaps most exciting in a while in a world of Legacy of Kains. 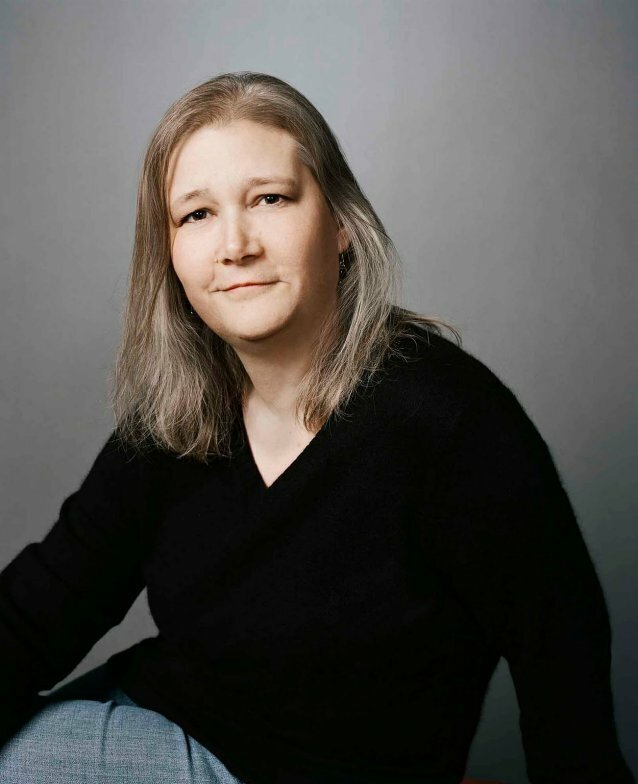 While she might not be thinking of returning to the franchise, given that Square Enix owns the series, this still might bring interesting games from Amy Hennig´s amazing talent for writing and directing. We can always hope that LOK has not completely left her mind but wish her all the best in creating her new projects, this time without the pressure of a publisher behind her back. 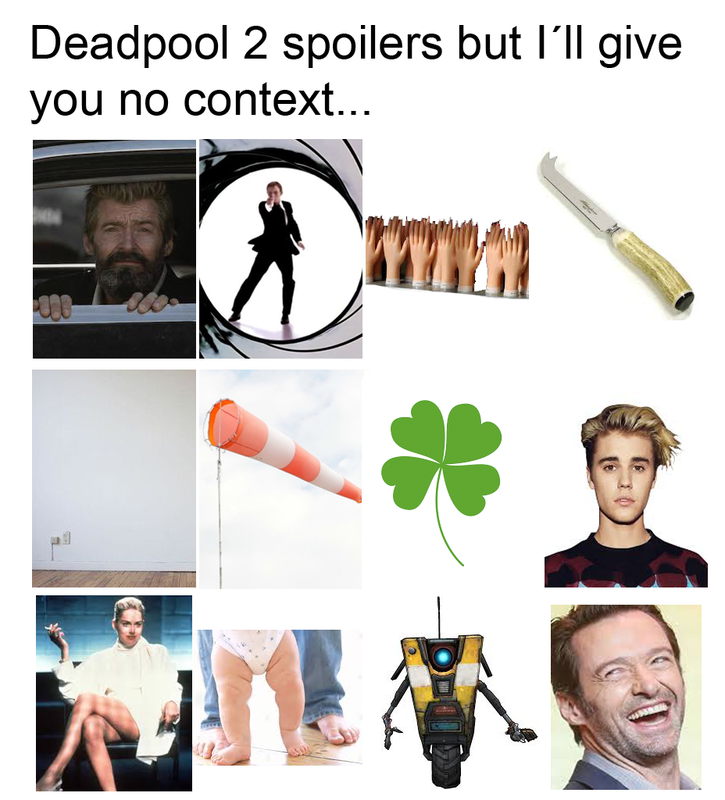 PS: Definitely go see it! Shadow of the Colossus is a legendary game and rightfully so. By coming to PlayStation 4, the players can finally experience the game as the authors intended, that is without any technical compromises. How did the new studio Bluepoint manage with this remake? It was 2006 and I somehow got to this gem on PlayStation 2. I must say that I've missed its predecessor, Ico, which was hard to find back then, but I got hooked on this unusual game where your sole goal is to defeat all the bosses. The original game, however, was plagued by the lower framerate, which was sometimes dropping to intolerable values. Despite that, the game was highly praised and got great reviews. In 2011, Sony has released a remaster with higher framerate for PlayStation 3, made by the very same Bluepoint. 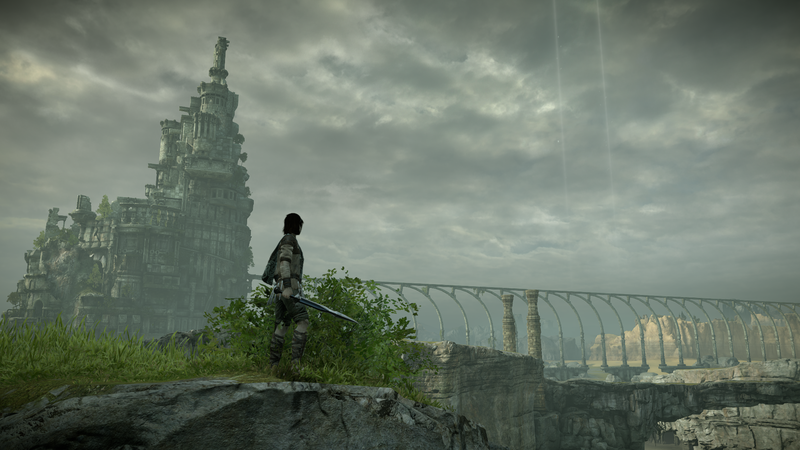 So why are we returning back to the colossi again for the third time? I can only assume that during the remastering the game they thought the game would look a lot better in current gen graphics with modern shaders and particle effects, so they have called upon Japan Studio for help and guidance. Thus, Bluepoint have created all of the art assets from scratch and all the previously low-res textures received a well deserved upgrade while keeping the source code and animations intact. If you think this was a waste, watch a video comparison of all three versions. On a regular PS4, you can achieve a stable 30fps, while PS4 PRO gives you the option to play in 60fps on 1080p resolution. 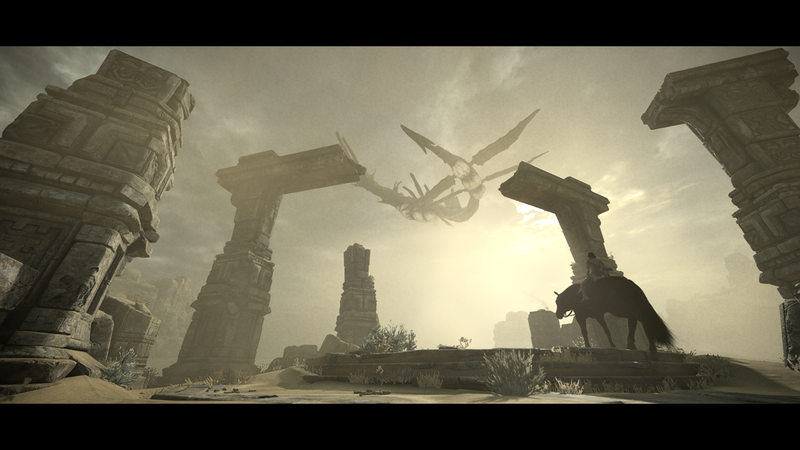 SOTC has a story full of emotions taking place in a seemingly empty world. 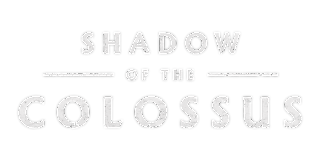 It´s primarily inhabited by the sixteen colossi, which our main hero must kill if he wants to resurrect his girl. It would be impossible to achieve in the land of the mortals, however, Wander has heard about a strange foreign land, where a god called Dormin can resurrect the dead. Determined, Wander embarks upon a long journey into the Forbidden land, where entry is punished. As soon as you see the weirdly structured bridge for the first time, you can recognize Fumito Ueda's signature architecture from Ico. You'll find many ruins and empty building which silently tell the tales of the old battles or the lives of its people. Wander, however, did not come to learn about these interesting tales of the old civilizations. After he gently puts down Mono on the altar, an ancient voice speaks out. Realizing that you are carrying the sacred sword, Wander is given his first task. Not heeding Dormin's warning that the price for this deed might be too high, Wander gets on his trusty steed, Agro, to fulfil his mission to take down all of the sixteen majestic colossi. This is just a short intro, but the game contains minimum cutscenes and focuses mainly on gameplay. 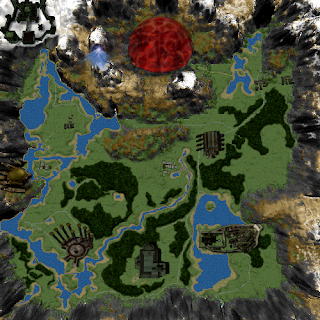 The game gives you a vast world to explore which is fun to traverse. In order to not get lost, you can always check your position on the map or just use the landmarks to orient yourself. You'll find plenty of unique rock formations, Stargate-like rings in the desert or pillars jutting out of the ground around that one corner. If you ever feel you lost your objective, there is an easy solution. Your sword is not just any random weapon. It reflects sunlight which can help you light up dark areas or, most importantly, point to the precise location where the next colossus is hiding. 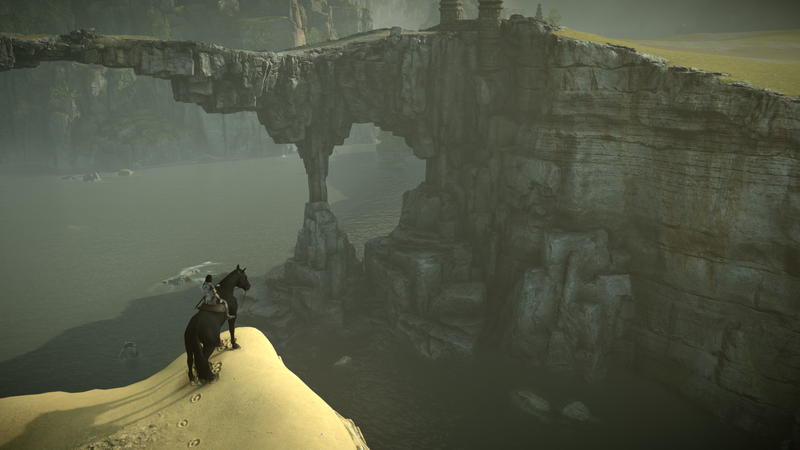 If Wander would try to get into this land on foot, he would probably still be running on that super long bridge you find at the beginning of the game. Luckily, his companion, mare Agro, is really fast and can tackle long distances with ease. You do not control her directly but by pulling her reins to turn or stop. You need to give her a kick to go faster. It's very effective and galloping across the plains never felt so majestic before this game. Agro will usually always try to reach you, but if you ignore her, she will try to keep herself occupied by eating the grass or drink from a spring you found. Sometimes she will start walking into the distance on her own but you can always call her back with a shout or a whistle, if she is too far away. 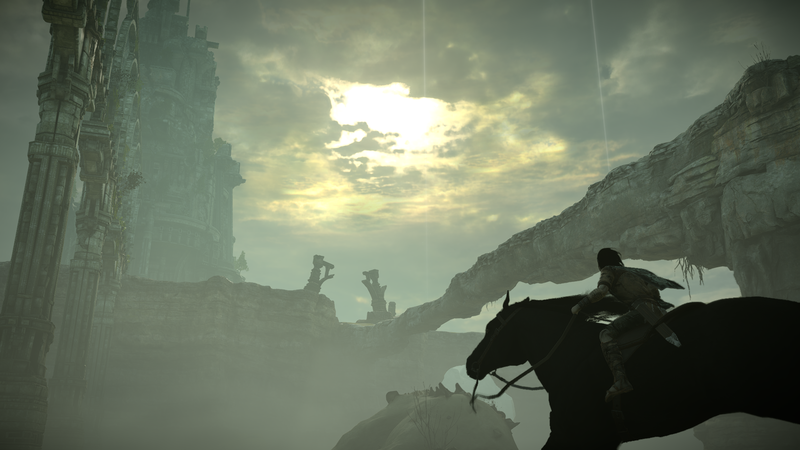 The world of SOTC is mostly deserted but beautiful. Wandering through centuries of nature unspoiled by human hands is thrilling and is accompanied by her serene sounds. From the rich green forests full of chirping to the wind blowing around statues half buried in countless sand dunes. You will visit several lakes, full of fish, whose silence is interrupted by Wander's splashing in the water. There is no time limit to achieve your main goal and that gives you the opportunity to just stop and look around. To think about how this ancient, crumbled city used to look like at the height of its existence. It´s so easy to just take a stroll through the forest, catch a few lizards to get an improved grip or search for the exotic fruit, which prolongs your life. You can even try to latch onto a passing flying hawk or a fish and see how long can you hold on for. There are lots of different things to do to keep yourself occupied in between the hunts for the colossi. This is strengthened by the stunning visuals, which changed quite a lot since PS2 was around. While the former blocky design was necessary in the past, now it's just a choice in places, where it actually fits. Many times I've stopped just to look at closer at those sharp textures on the rocks and ravines to make the best screenshot. Particles were also improved. Your horse now leaves hoof prints in the sand and Agro's tail and mane playfully flutter in the wind. 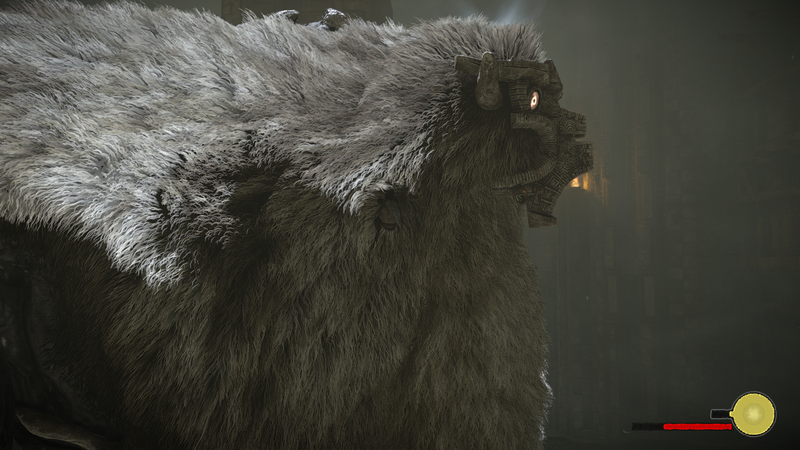 The fur on the colossi bends as you climb over it as well. There are other effects like light mist above lakes and inside forests, sand coming off rocks in the desert and I have never seen so many patches of lush green grass in one place. 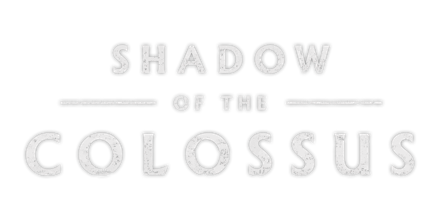 The battles with the colossi could be regarded as their own levels and are the biggest draw of the game. Every colossus has a different design, size and behaviour. Some are more aggressive than others and in order to beat them, you need to search for their weak points. Your bow serves more to draw attention of the colossus to that tiny human on the ground, which is you. Your special sword, on the other hand, is the only thing which can do any damage, though, and has to be stabbed into the glowing spot until enough of the black fog escapes. Once you have conquered the beast, it helplessly topples into a rubble of rocks and sand, as if it was just an empty shell. To climb upon such a monster is not easy. Luckily for Wander, part of their bodies is covered by thick fur which he can grab onto. It's not possible all the time, however, and you might need to find a way to flip over the colossus to reveal a climbing spot. Holding onto the alerted enemy is not an easy task either, as it will start to rock backwards and forwards as soon as he finds out that you are on his shoulder. This is where Wander's grabbing strength comes into play. You start with a small circle, which depletes rather quickly, but by eating lizard´s white tails, you can improve it significantly. The lizards are usually hidden around the checkpoint shrines but catching them is not easy as they are fleeting. If you manage to hold on (taking breaks on your grip can replenish it much faster at a risk of falling off), you have to search for the colossus' weakness which your sword can expose. Each glowing mark will take several charged up stabs before you have to move to the next one, but it is usually between two or three before the colossus succumbs to your will. The difficulty of each fight varies and while some are harder than others, it is not overly difficult. Sometimes you just need to use your environments to your advantage and lure the colossi where you need them, whether it be by hiding so it can't see you and it is fun to find out what works. If you'll take too long, Dormin will also give you a hint on how to proceed. The whole fight can take from several minutes to half an hour, depending on your skills and knowledge of the game. The source code of the game stayed while all the 2D and 3D objects where swapped out for their higher polygon versions. Bluepoint did an excellent job here while adhering to the structure of the original. The viewing distance has been vastly improved and now you can see 3D objects in the distance with ease. Graphics are not the only one which received an update, however. Even though the voice over, sounds and music stayed the same, they were all improved and now sound much higher quality. It is a joy to listen to Agro's hooves hitting the ground or immerse yourself into the majestic orchestra which accompanies your efforts to slay the beasts and fuels your efforts. Other times it can evoke a calm, melancholic atmosphere when you discover new locations. The intro and outro tracks bear a strong emotion but you should definitely listen to the whole soundtrack as it is brilliant. The controls were a bit clunky in the original but the developers have made Wander's motions more fluid and added two more modern control schemes. Unfortunately, both of them place the horse control on the triangle, which you need to hold down and it is very uncomfortable if you're trying to move the camera around with your right thumb at the same time. I have solved this by setting the horse command to R2 and grab to R1 instead in the PS4 settings and it was a lot better this way. To beat the game for the first time takes about 8-10 hours. 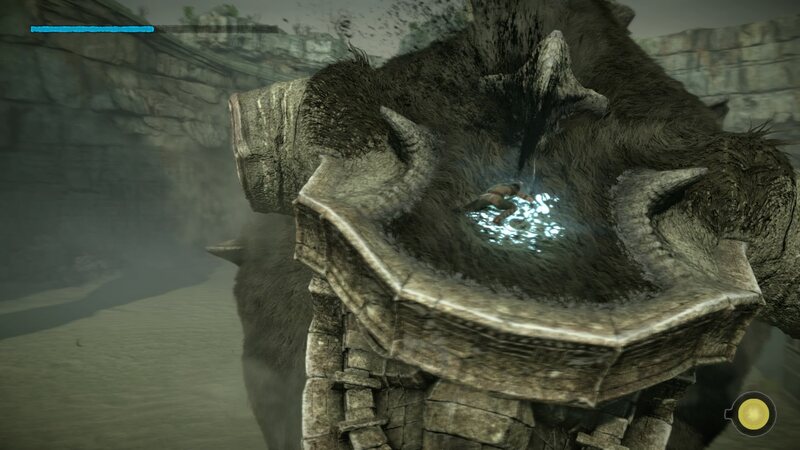 It is a bit of a shame that Bluepoint did not try to go further and bring back the missing eight colossi, which did not make the cut in the end. Throughout the world you'll find many deserted places, which almost beg for another epic confrontation. Time trials are back and if you beat enough of them you'll get extra items just like in the original (different weapon types, masks, or even a parachute). The main menu also offers concepts and screenshots to look at. At the beginning, you can choose from three difficulties – easy, normal and hard. I recommend going for hard as the colossi have more weak points this way and take longer to kill, as the game itself on normal seemed too easy. After beating the game you'll also unlock new game + and you can play the game in different screen filters. There is a newly added photo mode which is nice but I was a bit disappointed you can't position the camera freely. SOTC is still a unique title just like when it came out originally. If you have played it back then, on PS2, it won't harm to refresh your memory again in a much better visuals and in high-res with stable framerate. Even if you already own the PS3 remaster, this is a perfect remake worthy of your purchase. Thanks to Bluepoints hard work, new gamers can now fully enjoy this masterpiece in the shadow of the colossus. I have been a LOK fan since 1998. 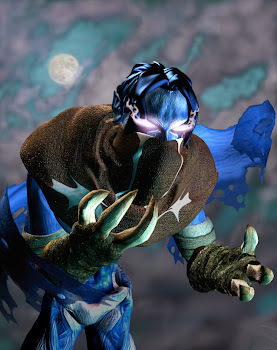 My favourite game is Soul Reaver. I am an active member of the community from 2003 where I began posting on NR forums. You can find me also on Eidos and Square Enix forums. I´ve helped to create games like Fall of Nosgoth, LOK Revival and currently actively working on Soul Revenant. In 2007 I have founded my YT channel, which has LOK related videos. For my artwork, check my DeviantArt page. Click on the pic to download the OST! Click on the pic to take you to the download section! Click to download the in-game OST! 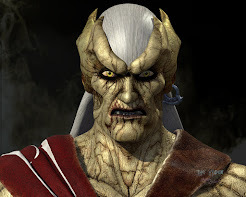 Why was Legacy of Kain canceled? Fan game Soul Revenant announced! Copyright 2009-2014 Raina Audron. All rights reserved. Awesome Inc. theme. Powered by Blogger.